These are lyrics by Whitney Houston that we think are kind of repetitive. Whitney Houston's, "Exhale (Shoop Shoop)"
Great song, but the subtitle is heard more times than the title. 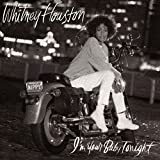 Whitney Houston's, "I Wanna Dance With Somebody"